Peterborough Sports celebrate a goal against Sutton Coldfield sending their fans wild! Photo: James Richardson. 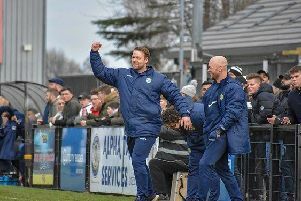 Peterborough Sports are now a maximum of six points from the Division One Central title in the Evo Stik Southern League after another fantastic day for the city side (April 6). While Sports were beating in-form Sutton Coldfield 3-0 in front of 152 fans at the Bee Arena, sole title rivals Bromsgrove Sporting were held 2-2 at home by Barton Rovers. Josh McCammon celebrates his goal for Peterborough Sports against Sutton Coldfield. Photo: James Richardson. Sports now lead by seven points with just four games to go and a vastly superior goal difference means five points would probably be enough to seal a third promotion in four seasons. Josh McCammon fired Sports into a 16th minute lead and goals in the final 10 minutes by dynamic duo Mark Jones and Dion Sembie-Ferris sealed a 27th win (from 34 games) of the season. Sembie-Ferris scored after a fine pass by Avelino Vieira - it was Sports 99th goal of a terrific Evo Stik campaign. It wasn’t all good news though as top centre-back Stuart Wall suffered a serious knee injury for the second time this season. There were celebrations over at Yaxley FC as well as they are now just a point from safety after a 2-0 home win over Coleshill Town. Mark Jones scores for Peterborough Sports against Sutton Coldfield. Photo: James Richardson. It’s been a great effort from the Cuckoos who attract smaller crowds and use a smaller budget than most clubs at this level. Charley Sanders and Tom Waumsley scored their goals today in front of 51 fans at the Decker Bus Stadium. Spalding United picked up a valuable point in their fight to avoid the drop in the Senior East Division of the Northern Premier Division, but it was almost so much better. Leon Mettam shot the Tulips in front in the 61st minute, but hosts Pickering equalised in the 90th minute. There was also late heartbreak for Wisbech Town on their 380-mile round-trip to Markse United. Danny Setchell’s first-half penalty looked like earning the Fenmen a point, but the home side grabbed an 87th-minute winner. Bottom two Gresley and Carlton were both well beaten though so Spalding and Wisbech are three points clear of the relegation zone. Stamford AFC lost 1-0 at runaway leaders Morpeth after conceding a 72nd minute goal. East Division: Marske Utd 2, Wisbech Town 1 (Setchell), Morpeth Town 1, Stamford 0; Pickering Town 1, Spalding Utd 1 (Mettam). Division One Central: Peterborough Sports 3 (McCammon, Jones, Sembie-Ferris), Sutton Coldfield Town 0; Yaxley 2 (Sanders, Waumsley), Coleshill Town 0 .